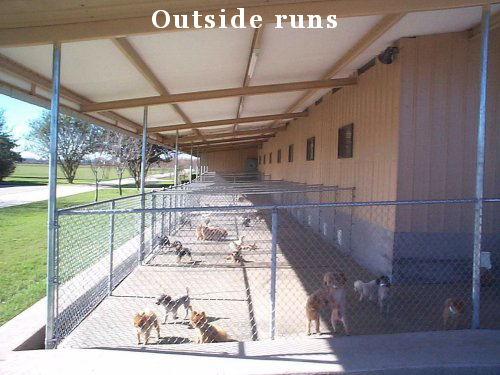 Here is the Outside Runs of our Kennel. Some of the runs are very large allowing the Teacup Poodles and Teacup Yorkies to run and get plenty of exercise. You can see the little doggie doors on the bottom right that the Poodles and Yorkies use to go inside or out. The walls are concrete about 30" high so they are easily kept clean and will not rote or deteriorate. The roof is insulated which helps to control the heat from the hot tin roof. It also stops water from dripping down when the humidity is high in the early mornings. The floors are sloped so that the urine does not puddle or stay in the run. It flows down into the gutter just outside the run, then down into the floor drain and into a septic tank, then into a treatment plant. It is kept very clean and sanitary. As you can see there is no dog waste on the ground anywhere outside the runs. Note the Pomeranians you see in the Picture we no longer raise.